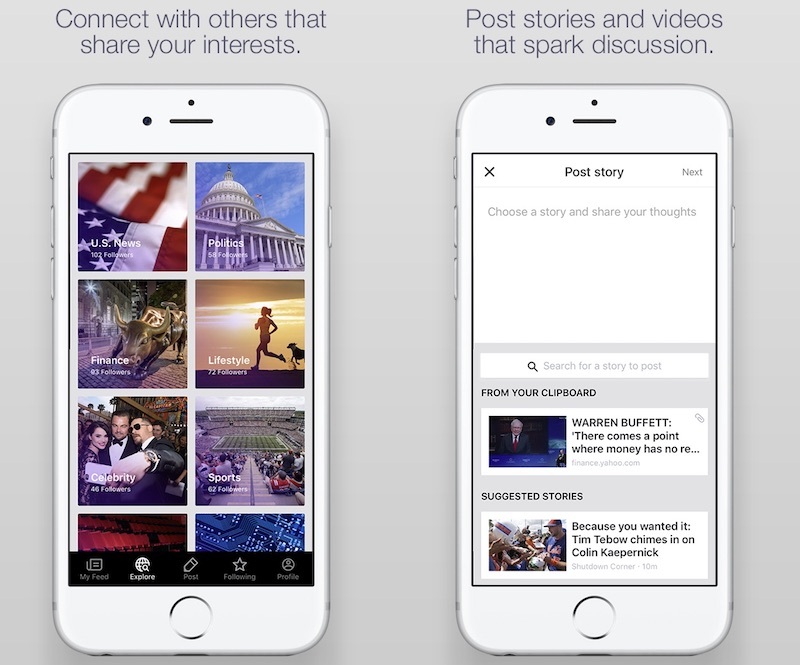 Yahoo today announced the rebranding of its core mobile app to "Yahoo Newsroom," where users can engage in conversations and social interactions about news relevant to their interests. The app makes it easy to discover new and breaking stories through a range of topics the company is referring to as "Vibes." Yahoo describes each Vibe as a "forum where you read, react, and debate topics that you care about." With every Vibe followed, the app's newsfeed "will adjust to include the stories and conversations that matter most to you," and the more the app is used, more user-specific content will appear for each person. Users can also post articles into various Vibes, along with their opinion on the subject, so other users can comment and begin a discussion. What’s exciting about this experience is that it empowers our community of hundreds of millions of global users to participate in and help shape the conversation. You can now post articles from around the web – with your reactions – directly into specific “Vibes” to spark a discussion. Yahoo’s personalization technology ensures that people who share your interests will see your posts and be prompted to join the conversation. The company hopes that Yahoo Newsroom encourages users to participate in discussions on a wide range of topics while being "free from social pressure" that might be present in other communities. Yahoo says its new app is specifically aimed at exploring the Vibes curated for you with "people that share your interests, not 'friends' on social media." These curated news sources are always way too biased. I miss the Circa app. When I see the word Yahoo I automatically am not interested. Although there are occasionally interesting stories that qualify as "news", much of Yahoo News is now little more than National Enquirer style articles mixed with clickbait. I'll pass on this app. With everything going on I was curious how Yahoo! 's share price was performing. Oh, the irony.